Last week Stan wrote his blog called ‘Change is Good’. The timing was perfect because it came at a time when I have been contemplating change. Stan’s blog outlined the ‘Stages of Change’ model – a breakdown of the steps one takes to make change in their lives. The model makes total sense and upon reading it one would believe that it can be easily done. Yet the reality is that most people do not make it to the 5th stage where the implemented changes become new lifestyle habits. How many of you reading this right now need to make changes in your own personal lives? Chances are that every one of us has changes we wish to make for the betterment of our lives. We as human beings have the ability to recognize these areas of our lives that need transformations and we have such good intentions to do so but rarely do we ever follow through. In most cases, we do not change because it is “too hard” or “too painful”. I asked myself why must change be so difficult for us to make? The process of making change is not easy and the ‘Stages of Change’ model failed to give warning to us that to make change in our lives there will be experienced discomfort and that most of us will stop right there. I kept asking myself why? And how can I get to the last stage outlined in the model? We decline change in our lives for so many reasons, everything from it creating that sense of discomfort to some irrational fear that tells us that making change will expose us to pain. By undergoing change we fear making ourselves vulnerable, our pride may become broken or even our dignity taken away from us - even if it is false sense of dignity to begin with that gives us a feeling of security. This is all more than we can handle… Or (let me re-word that by saying) it is more than we want to handle. I heard a great quote the other day: “Change moves at the speed of our pain”. Wow I thought, how true this is and how it resonated with me as I thought back to one year ago when a loved one of mine experienced a mental breakdown. I thought of his life and the changes he probably knew he had to make but did not for all the painful reasons one could give as an excuse. Until one day, all the emotions and negativity that existed in him manifested itself into a mental illness complete with anxiety disorder, depression and suicidal thoughts. It would not be until he almost experienced death where he would then consider making change in his life and how at that point it was even harder than one would ever imagine. Is the speed of pain bringing you to a stop in your life? For most of us it is not until we experience pain at a higher level do we then begin making transformations in our lives. Only then, when the risk of not making change is greater than making change do we then take action. Funny is it not? Why do we wait so long and end up letting pain dictate when we make change? How about thinking this way to create change: Change moves at the speed of the love and support we get in our lives? Why wait until it is too late before making change in our lives? We must recognize the love and support we have before us through family, friends, teams, god and anyone else that is willing to stand beside us and help us take action. Do we really want to wait until the darkest hour to make change in your life? The last thing I would ever wish for would be to look back and say: “I should have done this when I had the chance”…. Don’t ‘should’ on yourself and get busy living by doing what it is you know you must do as opposed to doing what you want to do. 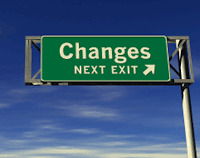 The change road is not an easy road but it is the right road so take the exit. Embrace the love and support you get and make change! want me to 'show you the money'? a world without accountability is chaos.